On 4 November 2015, ANIMA Investment Network and OCEMO (Office of Economic Cooperation for Mediterranean and Middle East) organised the first ever EDILE awards, in recognition of Euro-Mediterranean businesses that have made the greatest contribution to development in their towns, cities and countries. The event also saw the official launch of the EDILE label, the first label for evaluating the local impact of businesses across the Mediterranean region. EDILE is spearheaded by Anima and acts as an evaluation tool to help investors and regulating authorities. The goal of the new label is to promote a new dynamic in Euro-Mediterranean cities and countries. It rewards optimised local impacts from investment projects. “It is not a question of knowing whether investments contribute to local economic development, but looking at how they can contribute more,” says Emmanuel Noutary, Representative of ANIMA. EDILE was launched by eight Euro-Mediterranean partners and now includes investment agencies, lending institutions, and public and private strategic partners from various Mediterranean countries. Fifteen businesses are already involved in the programme and the EDILE team hopes to attract even more new businesses from various different countries for the 2016 edition. The awards ceremony was the opportunity to showcase their efforts. The goal is clearly to optimise the local impact of investment projects via 4 pillars: economic (best practices and contribution to the local economy), social (respect and optimise human capital), environmental (integration of the ecological factor), and community (creation of local value). 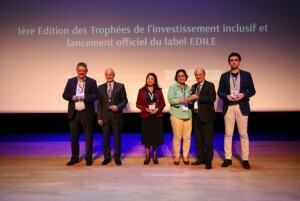 Six businesses (three from Tunisia and three from Lebanon) were awarded trophies by representatives of the Caisse des Dépôts et des Consignations (CDC), the EIB, the UfM, the French Development Agency (AFD) and OCEMO. Walid Belhafi (Centrale Laitière de Sidi Bouzid) received the Social Impact Trophy, Ahmed Ernez (Biome Solar) the Economic Impact Trophy, Bassam Baassiri (Green Eco Tech) the Environmental Impact Trophy, and William Boutros (WILCO PM) the Community Impact Trophy. The EDILE Gr and Prize for public impact from investment was awarded to two businesses, Lamia Sayahi (Veder) and Charles Noujaim (Shouf Nature Reserve).